The Samsung Galaxy S Advance manual or user guide now available for download in PDF format. The Samsung Galaxy S Advance manual is guide ebook that contain many reference information and instruction to operate this phone correctly and safely. 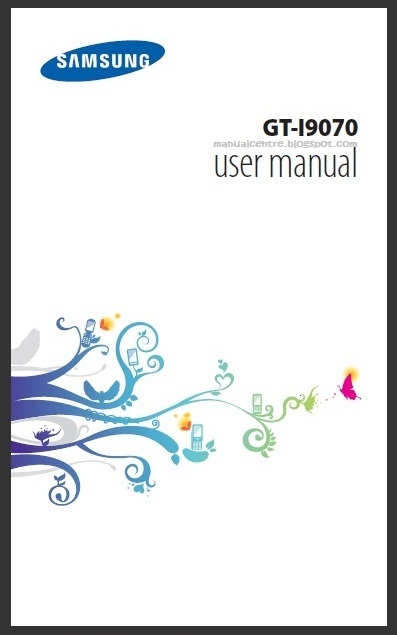 The Samsung Galaxy S Advance GT-I9070 user guide has 165, 5.81 MB and support in english language. In the Samsung Galaxy S Advance user manual, you can find information for example about installing the SIM or USIM card and battery, how to insert a memory card on page 16, learn phone basic operations, phone part overview, using the touchscreen, lock or unlock the touch screen, customise phone, synchronise data, using google mail, talk, social hub, using camera on page 58, videos on page 68, gallery and photo editor on page 72, listening music and FM radio.